April 23rd 2012 – My monthly diary for April continues with my ongoing experiment to grow fruit and vegetables in pots and various containers. This year I planted some orange and red peppers seedlings which I bought from São Teotónio Market in March. At 25cents each they were quite expensive, but still easier and cheaper than buying the packets of seeds and germinating myself. Next year I will see if I can save seeds from these plants and grow some from seed. Orange peppers are always very expensive in Portugal (€5.64 per kg) so I felt if I could persuade them to grow and yield at least two peppers per plant, they should actually save me money! This variety of cucumber has a very prickly skin which you need to remove before eating. I only bought the seedlings in February so they have progressed really quickly! It’s great to pop out to my garden and pick my own lettuce, radish and now cucumber. 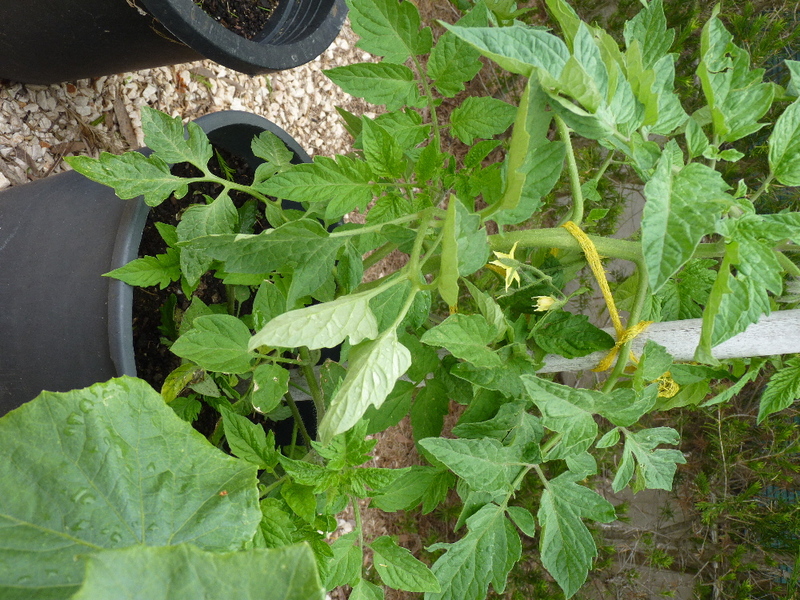 I bought several tomato plants in February which are now all doing well and are in flower. 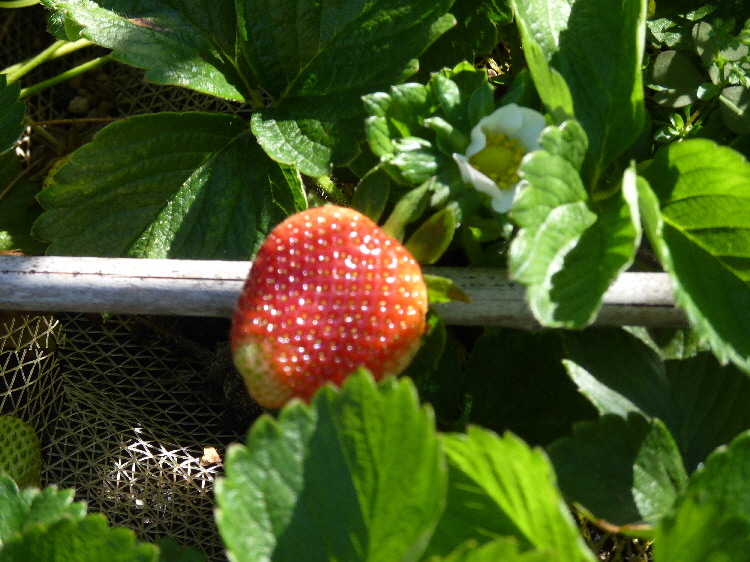 My strawberry plants continue to flower and produce a regular crop. 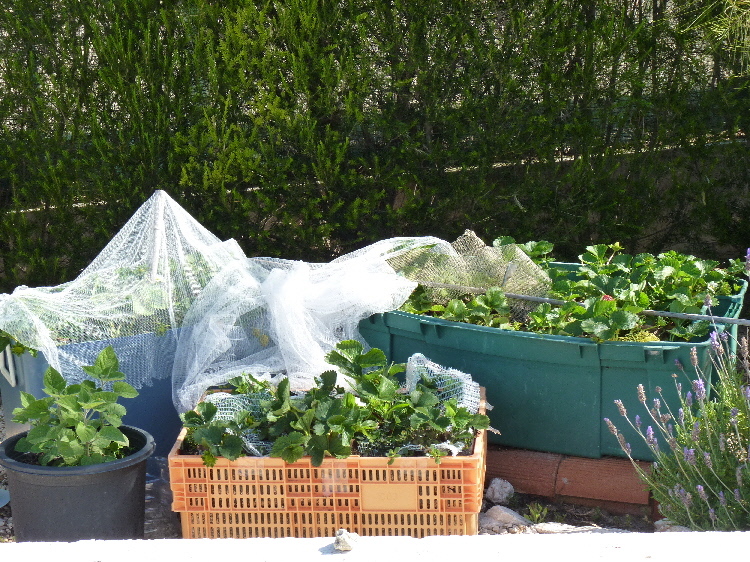 The blackbirds have discovered my delicious strawberries so I’ve now covered the plants with mosquito nets which I bought very cheaply at a local flea market. However, I need to think of an alternative option because once the nets are wet they cling to the plants and the birds just peck through them. The Rhubarb continues to grow however, I do need to plant directly in the garden but finding the right location is not going to be easy. 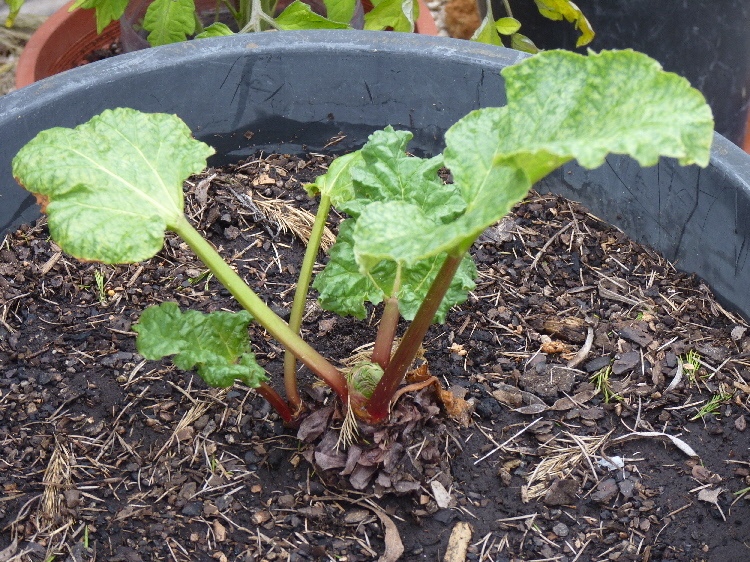 I may find some old bricks and build a raised bed just for my rhubarb! I bought this fruit plant at a charity flea market for just €2.00 All I know is that its fruit is a cross between a rasberry and a blackberry and it needs to be kept moist. I am going to transplant into a larger pot next year. Any ideas? 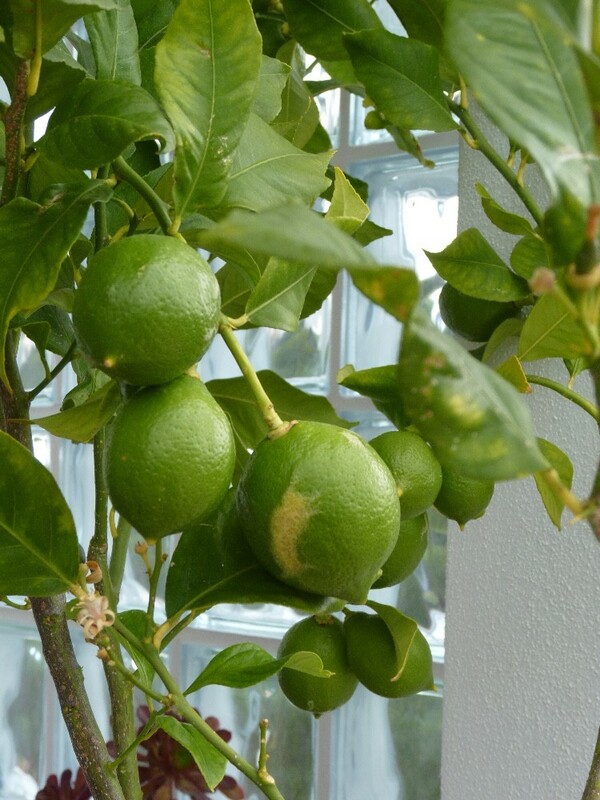 Lemon tree – continues to produce an abundance of fruit and massess of blossom. However, I do keep it well watered and feed regulary. Physallis – The seeds I planted last year have grown well over the winter and I have now transplanted into larger pots. The orginal plant produced fruit all through the winter, but I’ve now pruned the plant to encourage new growth. 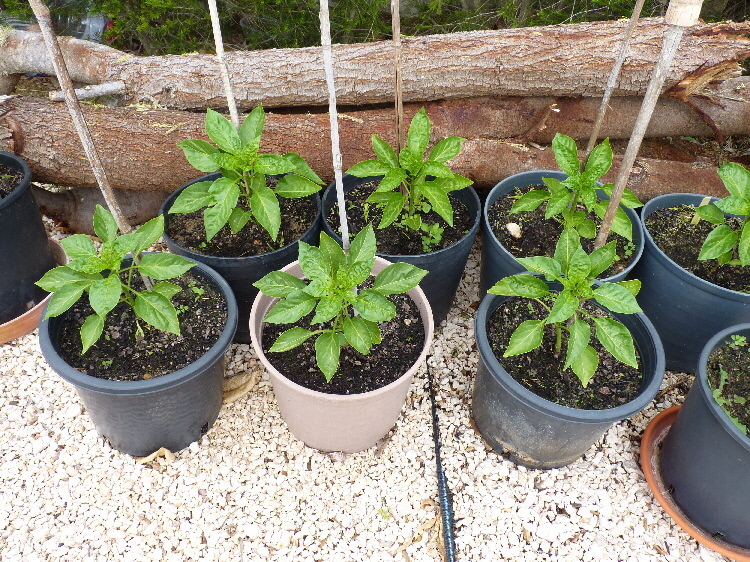 Chili and piri piri – last years plants are now straggly and I’ve used discarded seeds for new plants. Melons – seedlings are developing slowly, but at least they are still alive! Buy Auberine and more lettuce seedlings and rasberry and blueberry bushes. Plant radish seeds, cherry tomatoes. I now use organic feed to spray the leaves of all the above. This is an experiment as I’ve previously only used liquid feed. We will see. Tayberry, thank you! Watchi tis space…or should it be this pot? I have always thought I couldn’t grow anything in my garden as it is all concrete apart from the palm trees. Now you have inspired me to find some containers and start with those! Crates are really good, be inspired! I look forward to seeing what delicious things you make from these ingredients when they ripen. Take care. Just planted my own seeds in pots. Herbs, and such. They’re just coming up and it always amazes me how this happens – these tiny seeds growing into lovely plants and flowers. Good luck with yours! You might like my article today – I took a journalist to task! They changed their headline – not sure if I had anything to do with that, but it made me happy! I like the strawberry! I might try some of those in pots next season, since we have no room for a garden. Everything is looking great. could you make a frame for the mossy/blackbird netting. you could lift if off when you wanted to harvest the fruit. That’s an Excellent idea, thank you! It would also offer some degree of protection from the salt air and winds as well! Congralutations! You are doing so well, they all look great. You have your very own market garden. I grew cucumber for the first time last year and was not expecting short fat prickly ones, but they were delicious. Please can you arrange to send us some sun, nothing is growing well at the moment it is just too cold not to mention wet. 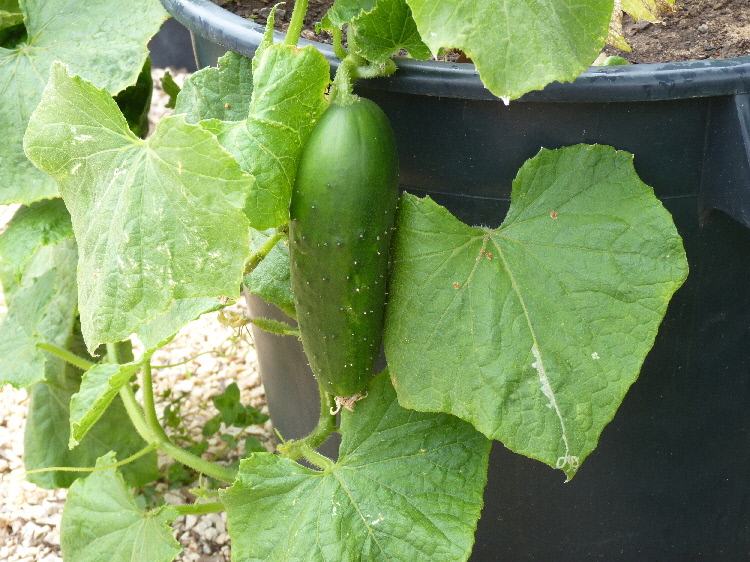 I wonder why home grown cucumbers are prickly? I thought it was just the variety we had here in Portugal. Apparently we did not have much sun while we were away in France and people say it was cold. My tomato plants have gone yellow, the plant people say it was too cold at night for them. Going to post pics for some advice over the weekend, as I’m not convinced that was the problem. Last year I grew those cucumbers with the prickly skins and they are delicious! I’m enjoying your gardening diary Carole – you are giving me lots of ideas for my own garden! That’s a pretty cucumber. That’s the kind we grow because they have a better taste than the prickle-free-ones meant for slicing. Isn’t it ridiculous how expensive the red, orange and yellow peppers are? I’m growing our own for that very reason. I have a couple in pots up here at the house and about a dozen in the gardens. Your tomatoes look lovely. I’m trying to grow some cherry tomatoes in pots for the first time this year. They’re looking healthy and have a few tomatoes on them already. I can hardly wait til they ripen. Your fruit looks delicious. I know your tayberry will do well for you. You have a super green thumb for growing fruit. The cucmbers are amazing and I’m going to try and grow some more from seed for later in the season. I’m having problems with my tomatoes now, taken some photos so hopefully I will post this weekend and looking for some advice 🙂 I must plant some cherry tomato seeds. This is my first year of gardening and I love all of your different container ideas! Looks fantastic! Hi, the garden looks neat and healthy too. The cucumber looks lovely, but strawberries and lemons take the cake! Happy Gardening. You get 50% more strawberries if they are grown off the ground. 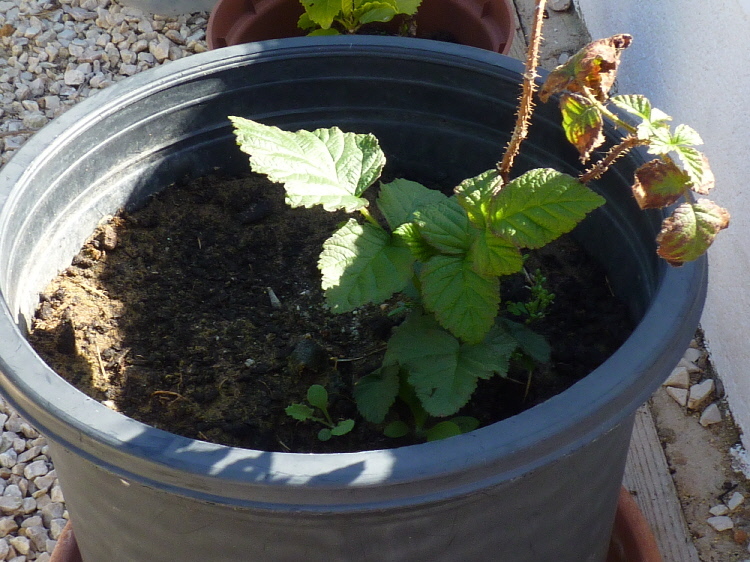 A few years ago I stuck a large tree branch into the ground and wired a few pots with strawberries in to the branches, I wound some copper wire around the base of the “trunk” as it prevents slugs & snails crossing it, and had no problems anymore there. I left space for planting a few runners, and within a couple of years it looked like a bush, and had great fun telling old gardeners about my Strawberry tree! It produced well, though the trunk rotted and I had to dismantle it, but the plants were getting a little pot bound, so it was for the best. It was a good little experiment, next I’m going to try the same idea but use/build a trellis to maximize yeild. Will let you know how it goes. Thanks for some great blogs, info is invaluable. Bless you. Will let you know and send some photos hopefully. Planning on using/recycling some 5litre water bottles with the bottom cut off, turned upside down, and make holes for water to irrigate ones below. Its just an experiment, so will see how well it works. Bless you. What a great idea. 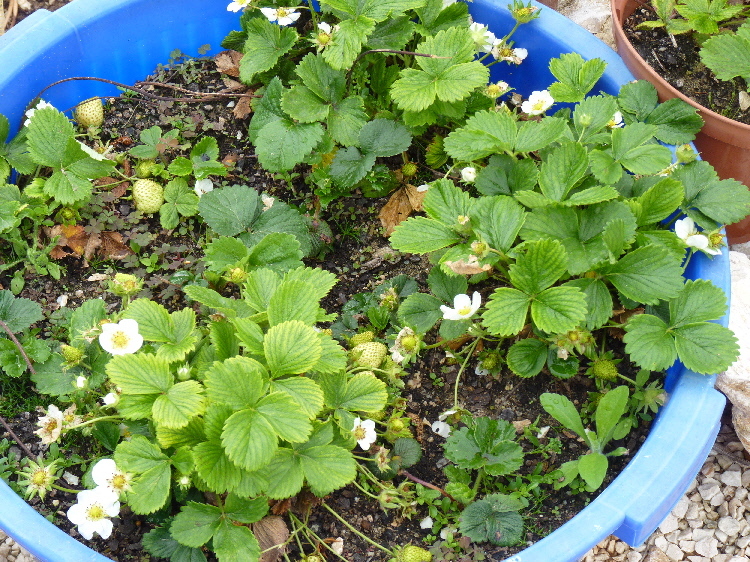 I shall; definitely give it a shot with the next batch as so many of my strawberries get nibbled by the bugs. And the trellis sounds like a cracking idea as well.